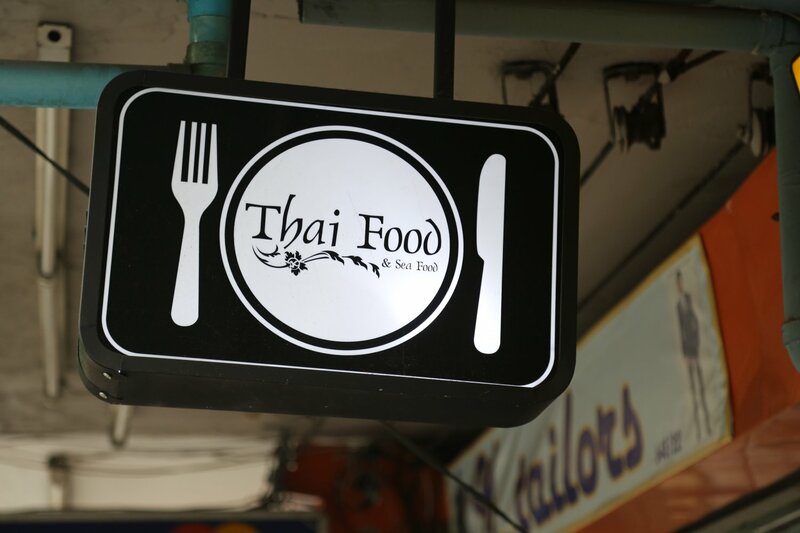 Thai food is incredible in it’s flavors and diversity. Street vendors are everywhere in Bangkok. Depending where you are in this city, you can eat at most any hour of the day or night. Most of these food vendors setup shop on a street sidewalk – they have a small glass container for displaying the food, maybe a few plastic chairs/tables and they will have a small stall for cooking the actual food – which is done by using a stove hooked into a propane tank. 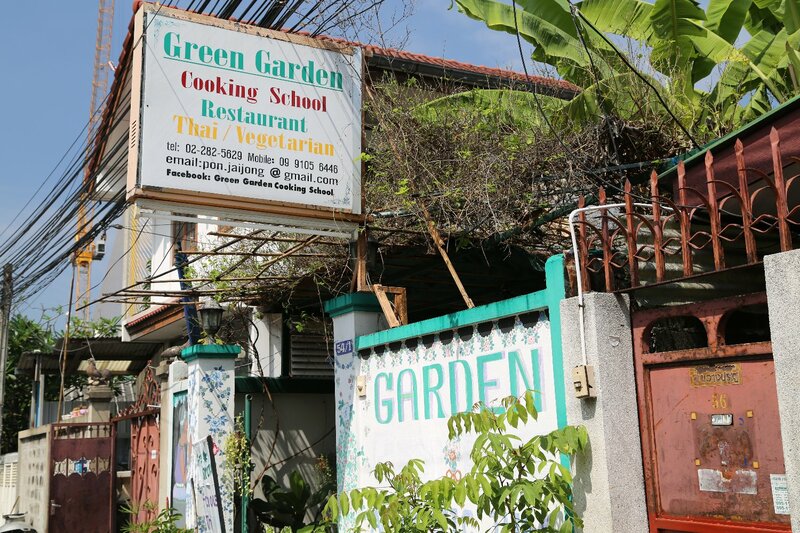 Green Garden Cooking School is located on a small street in the Banglamphu area of town – 54/1 Samsen Soi 5,Sam phraya. 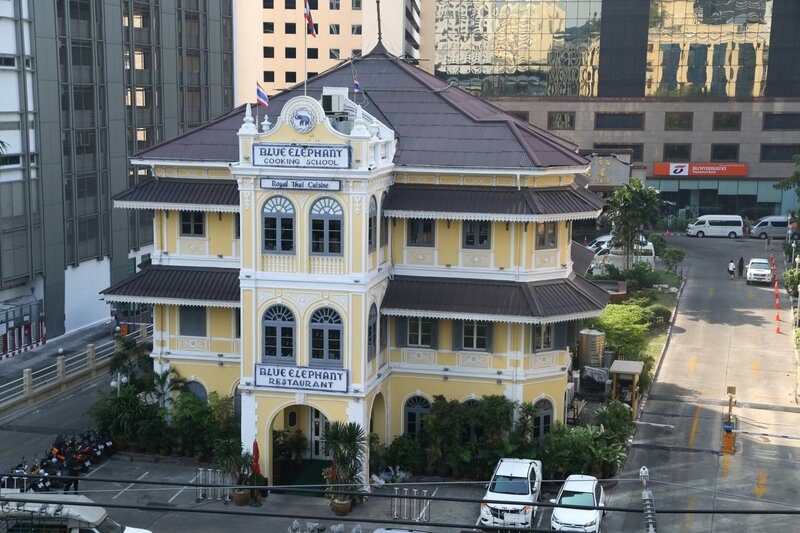 The Rama VII pier (#8) along the Chao Praya River is a very short walk to the school. So to is Wat In. And refreshingly the street is fairly quiet compared to some of the other nearby streets. 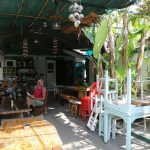 Blue Elephant Cooking School operates two locations, one in Bangkok (directly across from the Surasak BTS stop) and one in Phuket. 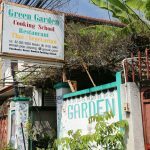 Chef Nooror Somany Steppe and her husband founded a number of restaurants abroad before setting up their cooking school in this old building in 2002 (after a number of renovations). 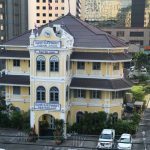 This prominent historical building was built in 1903 and used to be a department store in one of Bangkok’s most exclusive neighborhoods. Later history saw it being used by the Imperial Japanese Army for their Command Center. Dave eats food directly from the street vendors, in the markets, and in the restaurants. A good vacation is one in which he doesn’t get sick. Every trip to Thailand has been a good vacation! 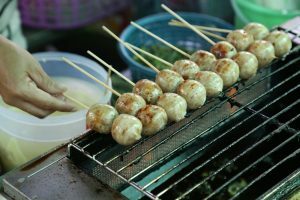 Some of the dishes he enjoys include a lot of seafood – fried octopus on a stick (a very common offering from the street vendors), squid, and fish cooked over coals in tin foil. 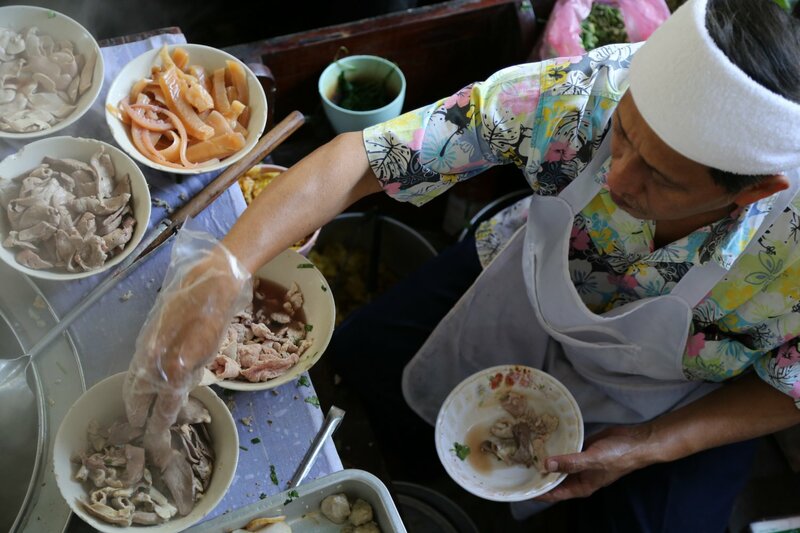 Also, the street vendors sell a variety of chicken, beef and pork dishes. Som Tum, a slightly spicy vegetable dish containing sliced up green papayas, tomatoes, and other assorted vegetables, is a favorite of the Thai people. The cheapest most filling dishes tend to be the vegetables or vegetables combined with a type of meat set upon a bed of rice. Soups are quite flavorful. Coconut soup which includes a variety of grasses, herbs, spices, and meats is a wonderful concoction! 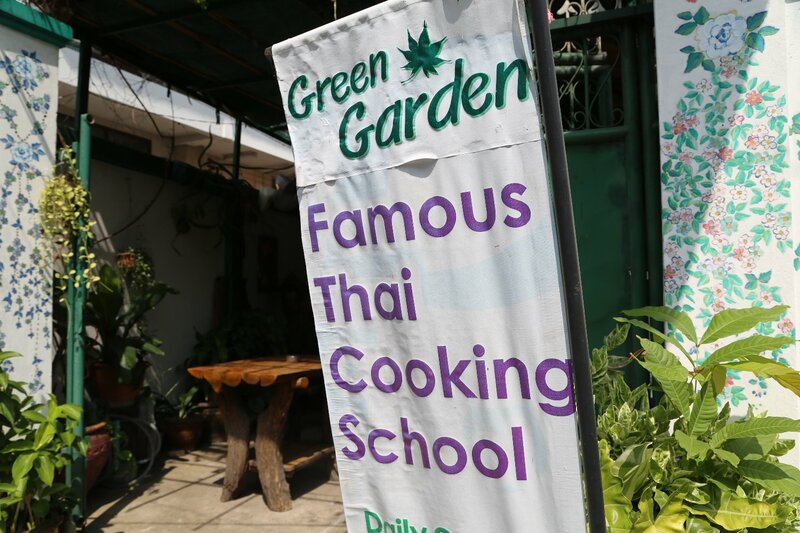 There are two main categories of types of food restaurants serve – one offers rice dishes (Khao – when you say this word you must use a falling tone, otherwise no one will know what you are talking about) and one that serves noodle dishes (Kuay Tiew) – pronounce the “k” like “g” as in Garlic. Curries tend to be quite spicy – at one point I lost feeling in my tongue after eating a particularly spicy dish! Fortunately the feeling returned just in time for dessert. 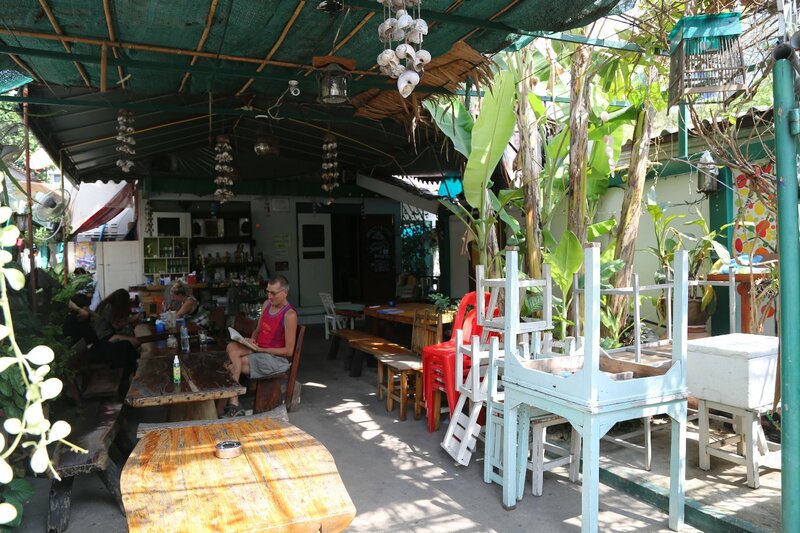 Dave’s Tip: If you want to eat spicy Thai food with a minimum amount of pain – before your travels begin a spicy food regimen 2 to 3 weeks in advance, in which every day you eat mild spices – things like Tabasco sauce and mild peppers. 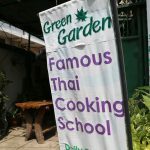 This will do wonders for your ability to eat some of the Thai spicy food when you are in Thailand. If you eat something spicy, its best to continue eating instead of reaching for the water glass; eat something not spicy such as regular rice. This will help to slowly diminish the pain instead of trying to use water which after swallowing seems to make the pain worse. Eating spicy foods is a taste that can be somewhat acquired. We have found that after several weeks of eating spicy foods our taste buds have changed to the point where we could eat most spicy foods without there being a huge burning sensation in the mouth or clogging of the sinuses. 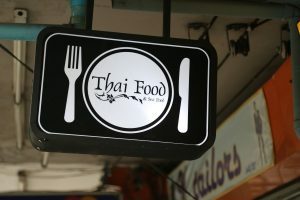 Forks and knives are mostly provided when eating Thai food – chopsticks will sometimes be provided or you may have to ask for them. To eat Thai style for soups you use both chopsticks and a spoon. When eating regular food you scoop a small portion of one dish onto your bed of rice and then eat it. When finished you scoop another portion of the dish onto the rice, finish it and go to the next coarse. 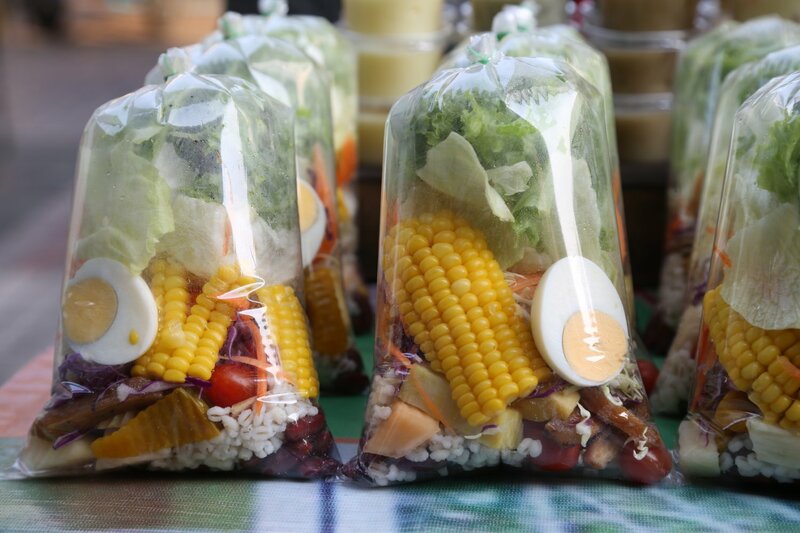 Thais in general do not mix their food in the rice – they take only a small bit of one dish at a time. The wonderful fruit shakes can be quite addictive. Often we would order up to 6 different shakes at the same time such as coconut, watermelon, banana, mango, papaya, & pineapple. The waiter would bring these drinks all at once and then start placing one at a time in front of other other people seated at my table. There would be a moment of strained silence, and then without saying anything I would collect all the drinks and move them in front of my place setting. The waiter would stumble out his apologies, look baffled, and then walk away, no questions asked. Boat Noodle is a type of street food – a soup usually with pork or beef or fish balls. When made properly, is very tasty and highly recommended. Comes with a choice of noodle types ranging from thin to larger. The soup comes already cooked and then you add basil leaves, sprouts and an assortment of table top spices including pepper, fish sauce and sugar among others. 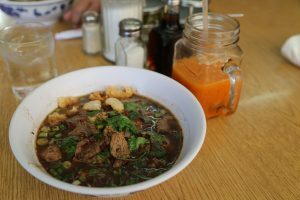 This type of soup is commonly found on the streets of Bangkok – in some parts of town you can find it all night. A tiny slice of Bangkok is even dedicated to this type of soup – called Boat Noodle Alley near Victory Monument. 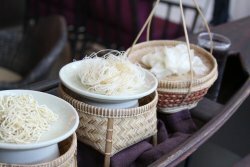 Sen Mee is the smallest type of the Thai noodle. Sen Lek is slighly larger followed by Sen Yai as the largest of the generic Thai noodles. “Joke” (pronounced like it sounds) is a favorite breakfast dish. 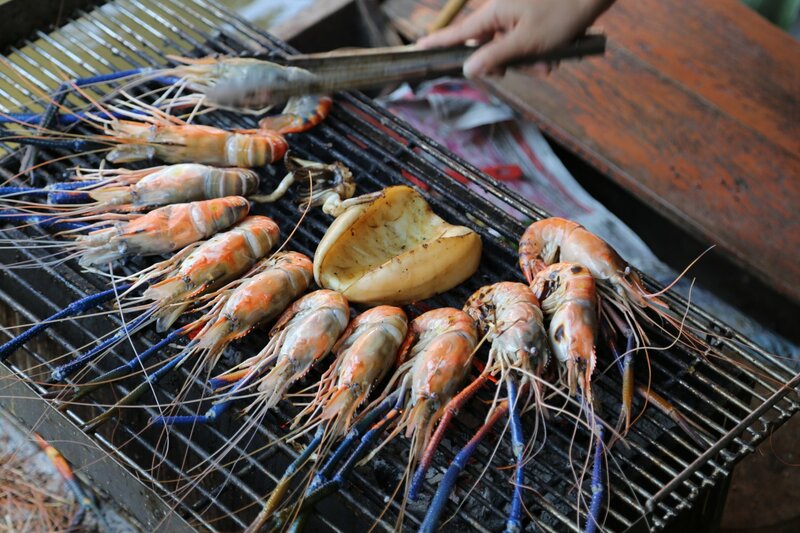 This dish actually originated in China and has spread to several nearby countries including Thailand and Vietnam. Its even called Joke in Chinese. This dish consists a raw egg which is mixed in and cooked in hot porridge. In addition several spices and shredded ginger is mixed into the porridge. You can find this in the morning at many of the restaurants or outdoor food vendors. Kob Kratium (pronounce the “k” like you wood “g” in garlic). This is also a favorite dish. It is best to cook this dish with frog legs but other meat such as chicken or pork may be substituted. You first prepare with a mortar and pestle, garlic, red peppers & salt. Then you fry this mixture in deep oil, and you cook the meat the same way. You serve the meat with the fried garlic & pepper. Lod Chong is a wonderful sweet desert type drink made from syrup of coconut milk and palm sugar with ice, a little salt & green leaf flavoring. You can commonly find this from street vendors. Pakached is a simple dish where the main ingredient is a plant that grows in water. This plant grows a white foam like material that surrounds its main stems thus allowing it to float in water. Only the young tender shoots are harvested for cooking – the rest of the plant is too tough. A mix of sugar, garlic, pepper, soy beans & oyster sauce is used to cook this dish. Its quite tasty and not too spicy. 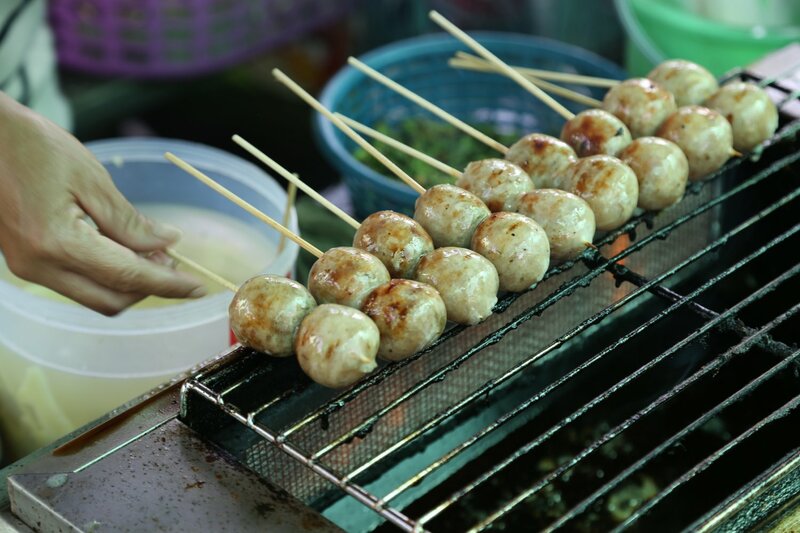 Meat on a Stick – these are commonly found throughout Bangkok and the rest of Thailand. They are the epitome of street food and are inexpensive, quick to cook and delicious. The types of meat vary from chicken to beef to pork. The sizes and prices do vary. Often the liver and heart of an animal may also be available. The vendor will usually have several of these “kebobs” pre-cooked and will warm them for you as needed. 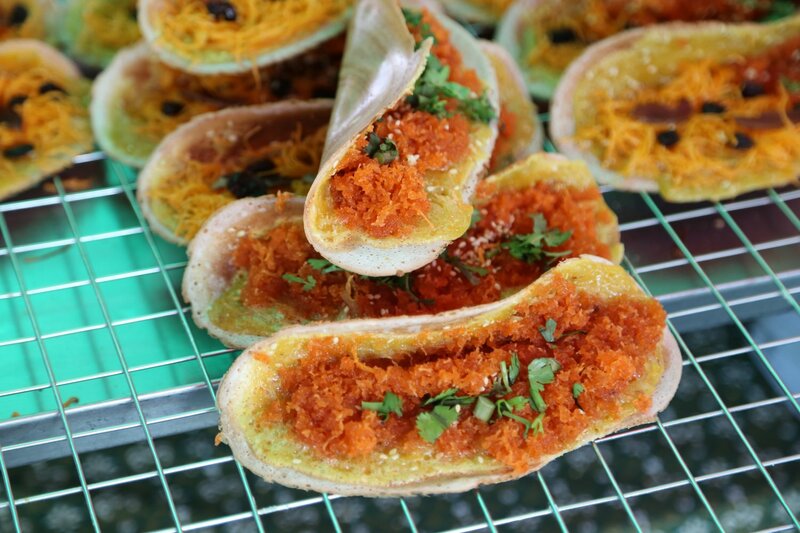 Som Tum is spicy papaya salad – usually green papaya is shredded but other greens can be used. There is “raw” fish, many hot red peppers, tomatoes and other spicy seasonings. This is not a dish to be ordered by someone who does *not* like spicy food. Prepared correctly, this dish will in fact make your mouth water! Tom Yam Gai – is a spicy very delicious chicken soup. Many Thai herbs, leaves and other flavorings are in this soup including but not all – Galanga root, a citrus related leaf, lemon grass & lime juice. Tom Yum Tale is similar to the Tom Yum Gai except seafood is substituted instead of chicken. Unlike typical Tom Yum’s found in most Thai restaurants outside of Thailand – a fresh properly prepared Tom Yum will have Galanga and Lemon grass tender enough to eat. Tom Kha Gai is a similar dish but is cooked in a base of coconut milk instead of water. The soup may be served in a round metal bowl in which there is a candle underneath the main bowl to keep the soup warm at your table. No lemon juice is used in Tom Kha Gai. Thai drinks are very good and are usually served in a plastic bag with a straw. In fact, straws are served any time you sit down to drink. It is considered offensive not to use a straw. Dave’s favorite Thai drink is the Thai ice coffee in a plastic bag. Nam priks are basically seasonings that are used in Thai food. Several basic “priks” are usually just found sitting on tables of restaurants, and you add them to your meal once it is served. We never have any problems with getting sick from the ice in any of the restaurants we have eat at – and we eat at some very cheap restaurants (they were always clean however). Apparently the ice was always made with purified water before it was placed into the drinks. 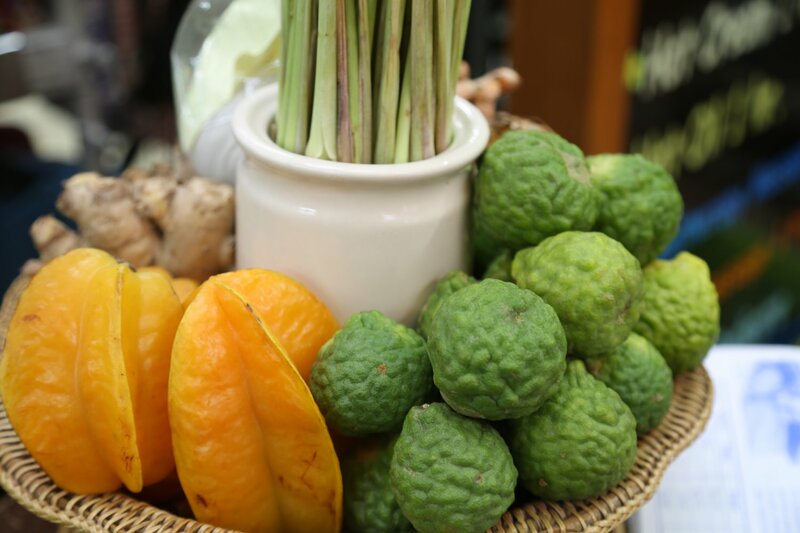 Salacca (snake-fruit), several varieties of Bananas, Guava, and several other fruits that remain unidentified. There are some markets in hard to find alleys tucked away in Bangkok that have excellent varieties of fruit. I’m sure some of the vendors thought it was strange to see a westerner shopping solely for fruit! There are several places in which are many fruit vendors; one was along Ratchadamri Road near the World Trade Centre and the other place was along the Chao Phraya River at the numerous pier stations (the pier stations are where the river boats arrive and leave from – there tends to be quite a few fruit/vegetable vendors gathered around these areas). 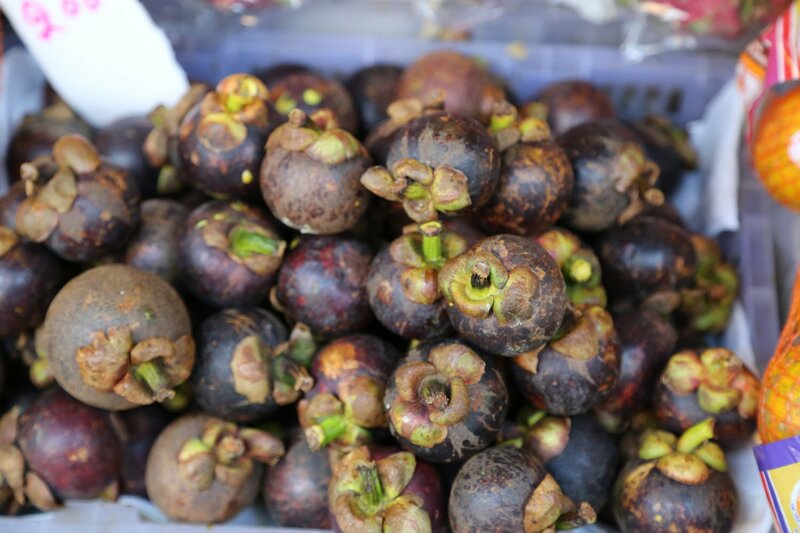 Fruit out of season such as Mangosteens and Rambutans used to be priced extremely high and found in only select parts of the city. These fruits have come down in price significantly in the off season and can be found in select high traffic areas of the city including parts of Sukhumvit and near major shopping malls.